It's freezing out (yes, really 32 degrees!) and my ears are so cold, and I, as always, have nothing covering them, or my head. Winter hats never have been my thing. I've got dozens of scarves, but no hats. I was watching the movie "Love Actually" a few weeks ago, and the character Natalie (the 'plump' one who works for the Prime Minister) was wearing a red coat with an over sized white hat. And I loved it. So I went into Khols and got the only white hat I could find that was actually cute - this beret style one. But here's the thing: it doesn't cover my ears. So I've continued my search and found the perfect hat at modcloth.com. 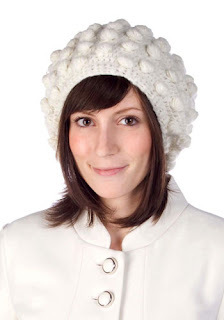 It's called the Popular Beret, is oversized to keep my ears warm, and best of all, on sale! I know this one doesn't match hers exactly, but it matches my memory of the hat, fused with my own love of the playful popcorn stitch of this hat.